▲ Around 200 people in hanbok assembled at Hongdae Playground on Sept. 26, performed an identical dance to tape a flashmob. Hanbok, the traditional Korean clothes, is characterized by the bright, vibrant colors and sophisticated lines of the Joseon Dynasty style. It amplifies the beauty of the traditional Korean form, which emphasized ancient wisdom and charm. Evolving in different patterns and styles in each historical period, hanbok is one of the most visible aspects of Korean culture. Unfortunately, a proper appreciation of hanbok is often neglected by people these days, especially those in their 20s, compared to their much higher preference for clothing from the West. “I envied the large number of Japanese people I saw on the streets wearing traditional clothes. In Korea, by contrast, encountering someone wearing hanbok on the streets is unthinkable. This is because we perceive hanbok as too uncomfortable and formal to wear casually,” Park said. Park traced the reason for the bad impression of hanbok to a lack of recreational environments where people can enjoy themselves while wearing hanbok. She began to search for unique events that people could participate in. “While I was looking for an event or some popular entertainment that has an immense ripple effect online, flash mob occurred to me. A flash mob is often video-taped to depict people performing an unusual act for the purposes of entertainment,” Park said. 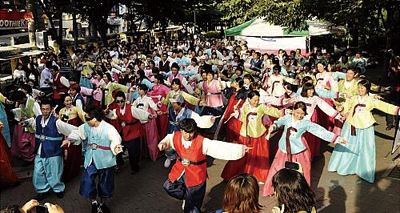 On Sept. 26, 2011 at Hongdae Playground, 200 people in vivid and colorful hanbok gathered and began identical, choreographed movements to music. “I saw an online banner inviting people to participate in a flash mob wearing hanbok. As I have been studying in the United States since middle school, I’ve long felt myself lacking knowledge of Korean traditions,” Lee Ye-jin (William Carey University, 2) said. “The day was unbearably hot, and we were all sweating, but when the music began, our discomfort instantly vanished, and we were frenetic with excitement,” Park said. A flash mob was not the only event held. The 200 people in hanbok split into 10 groups and penetrated the streets of Insadong, Gangnam Station, Myeongdong, and Hongdae Playground, where a lot of people gather. Together, they strutted about the streets performing parades, taking photos, and holding free-hug events. “Each group received significant support and attention from foreigners and the elderly. At the end of the day, I realized that many people still recognized the value of hanbok and loved it, but just did not have the opportunity or excuse to wear one,” Park said. “I hope more dynamic events are organized in the future pioneered by people in their 20s to popularize Korean traditions, especially hanbok,” Heo Neung-kang (Soongsil University, 1) said. For its creative motivation and its devotion to Korean culture, Hanboknoridan is supported by Cyworld Dream Campaign, which strives to make a person’s vision come true. Also sponsored by SK Communications, Park’s dream of holding a flash mob event of young people wearing hanbok was selected for funding and has received financial aid throughout the process. “I feel thankful to have won such support. I treasure it as belief in the group’s great devotion to promoting hanbok. I will be back in November with more innovative items and will continue publicizing the beauty of hanbok,” Park said.